Aries season is upon us and we honor and celebrate those born between March 20th – April 19th. Also, those whose Moon is in Aries! Have you ever discovered what your moon sign is? You can get your free Natal Chart from Astrostyle or use the TimePassages app (free). Now lets learn about the crystals that can support our strong and fiery Ariens. 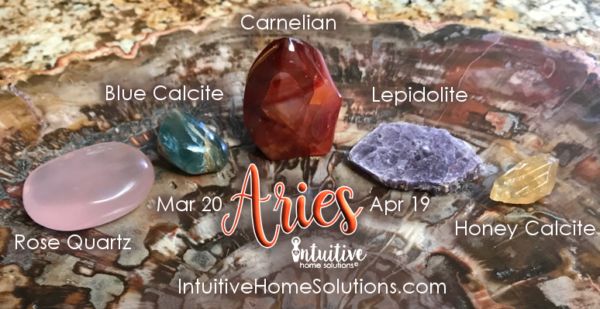 There’s always going to be boundless images on the net and on Pinterest that claim which crystals are for Aries (and all the other signs in the Zodiac), but lets take a look at WHY certain crystals can support an Aries or a person whose moon is in Aries. 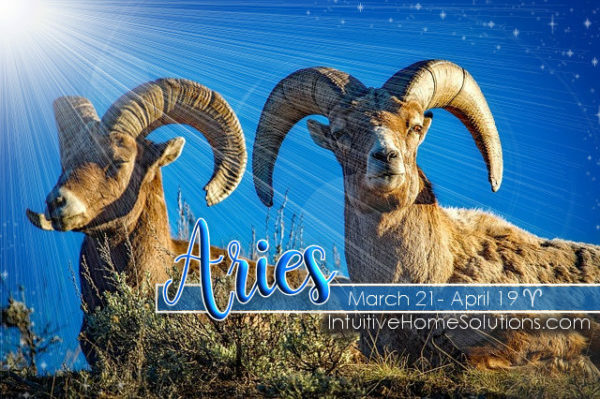 One of the foremost characteristics of an Aries is the symbolism of rebirth, renewal, and new beginnings. Aries is the first in the line of in our Zodiac and leads the way. For rebirth we work with Rose Quartz. 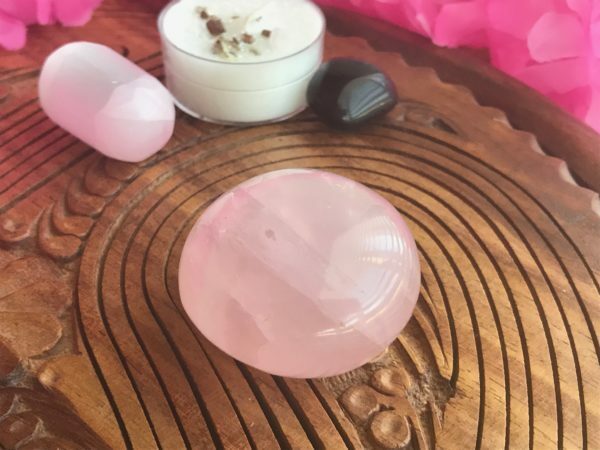 Rose Quartz– Rose Quartz is the traditional stone of love and for any rebirth process we need to have a good foundation in love. Love is what inspires us to go further in life. Ariens tend to be generous souls, always willing to lend a hand when someone is in need. They usually are seen as having a magnetic personality and draws people toward them. Argentinian Blue Calcite– This form of blue calcite holds a lovely water energy, as if from the sea herself. 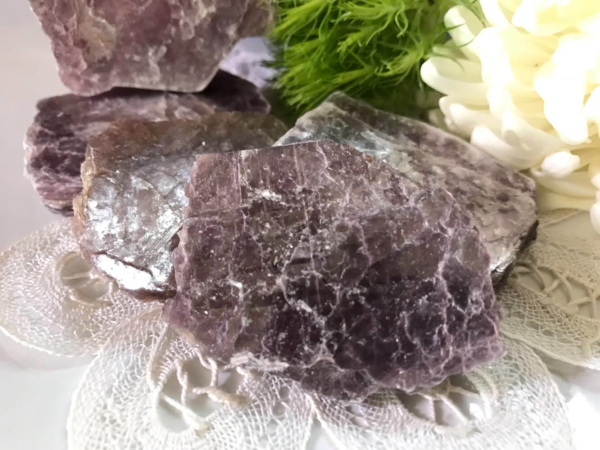 This crystal is to offer support to our zodiac brothers and sisters because Aries is know for having a quick and hot temper. 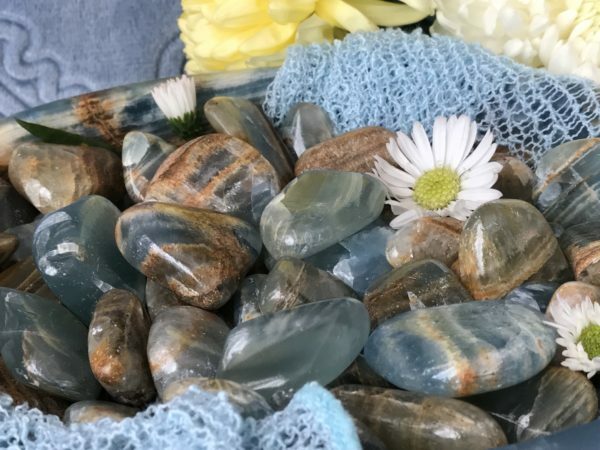 Blue Calcite cools those hot emotions to bring balance to their mood. Carnelian– In the photo above you’ll see a Carnelian flame because Aries is a fire sign in the zodiac. 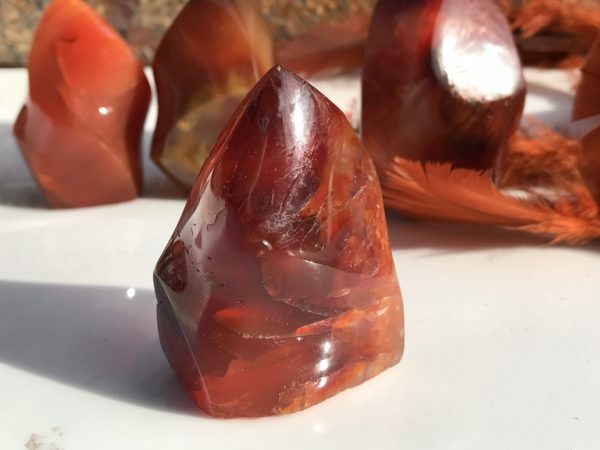 While Aries holds its own fire energy, the Carnelian stone is known for creativity and energy. If you know an Aries you may have noticed their ability to take action when it’s needed. This is a spectacular characteristic and Carnelian is there to support this strong vibe. 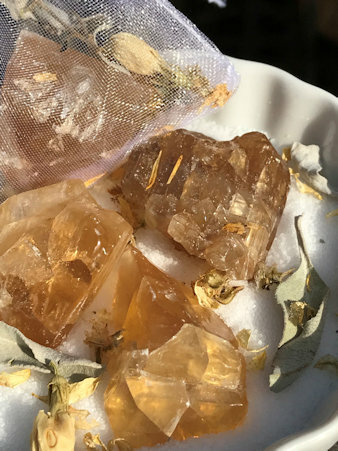 Honey Calcite– Aries is known for being optimistic and optimism is supported through honey calcite. This juicy and sweet little crystal is buzzing with positive vibes! Dreams and Animal Totem: If a ram has presented itself to you in a dream, it could be a message that there’s an opportunity and you need to lower your head and charge full steam ahead. It could also mean you have an obstacle to get through and your ram spirit animal is there to guide you to break down those barriers.